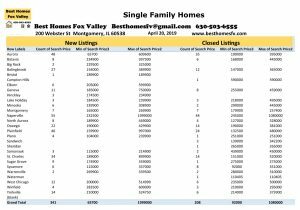 Market update Fox Valley-April 6 2019. The market continues to improve. New listing this week were up. 415 new single family homes listed compared to 351 last week. As you can see, if you are looking for a home above $200,000 you have a better chance of finding something that fits your needs. If you are below that you have to look a little harder or expand the communities that you are looking in. 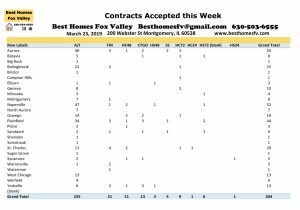 Closed listings this week were consistent with the week before. 202 this week compared to 200 the week before. Usually the first week of the month are lower. Most buyers want to close at the end of the month. Contracts accepted this week were slightly higher this week. 309 this week compared to 297 the week before. With more homes coming on the market these numbers should steadily increase as the month continues. Short sales accepted this week by Sellers was slightly up this week. 5 this week compared to 3 the week before. These numbers are still very low. That is a good thing. There was 1 each in Montgomery, Naperville, Oswego, Plano & St Charles/Campton Hills. 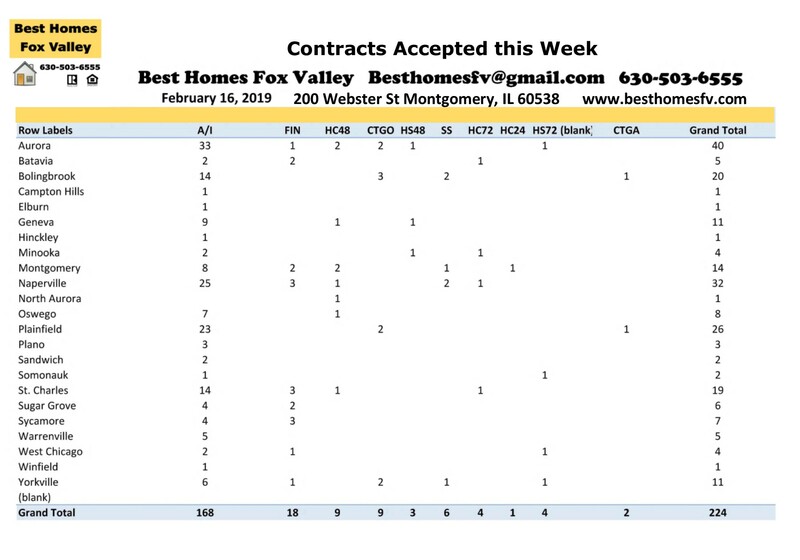 Sellers accepted contracts this week that are contingent on the Buyer closing on their current home before purchasing. 9 with a kick-out clause of 72 hours and 11 with 48 hours. Contracts were also accepted by Sellers that the Buyer still needs to sell their current home and close before purchasing. 3 with a kick-out clause of 72 hours and 4 with 48 hours. Call us at 630-503-6555 Jeffery Szymczak-Broker ext 104, Bobby Burson-Broker ext 105 or Kristine Heiman-Managing Broker ext 101. Our goal is to negotiate price and terms that are best whether you are selling or buying a home. We will explain the process so you know what to expect. Give recommendations of loan officers, real estate attorneys, home inspectors to contact that we have successfully worked with. Market update Fox Valley-April 6 2019. Have a great week! Another way to search for homes. 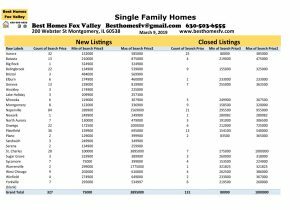 Market update Fox Valley-March 9 2019. Spring market is here and pretty consistent so far. 327 new listings of homes this week compared to 344 last week. We are only 9 days into March and look at it compared to January. We are on our way at passing up the totals for February as well. Closed homes this week were down but that is to be expected with the beginning of the month. 131 this week compared to 243 last week. The numbers should increase as the month continues. You do not want to miss this market if you are wanting to sell this year. It is time to get your home on the market. 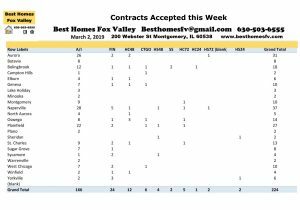 Contracts accepted this week were higher than last week. 267 this week compared to 224 last week. Increased inventory really helped with these numbers this week. We are definitely passing up January numbers and are already passed the halfway mark with February numbers. March should be a fantastic month if new homes continue to come on the market. Inventory of homes to show buyers has been an issue for the last couple of years. Short sale contracts accepted this week by Sellers increased this week. 8 this week compared to 2 last week. 1 each in Aurora, Bolingbrook, North Aurora, Plano, St Charles/Campton Hills and Sugar Grove. 2 in Montgomery. Sellers accepted contracts this week that are contingent on the Buyer closing on their current home. 5 with a kick-out clause of 72 hours, 7 with 48 hours and 3 with 24 hours. Contracts were also accepted by Sellers that are contingent on the Buyer selling and closing on their current home. 2 with a kick-out clause of 72 hours, 3 with 48 hours and 2 with 24 hours. Are you thinking about selling? We will update the value of your home for today’s market. We will provide you with a net proceeds that shows you an estimate of the expenses to sell. This will be updated when an offer comes in and we know all the terms. Thinking about buying a home? Your first step is to call a loan officer to get pre-qualified so you know the type of loan and the price range that will work out best. They will provide you with a letter showing what you are pre-qualified for and that will go with an offer when you find the right home. Market update Fox Valley-March 9 2019. Have a great week! New tool to search you can see a birds eye view of the home and neighborhood so you can see where it is within the block. 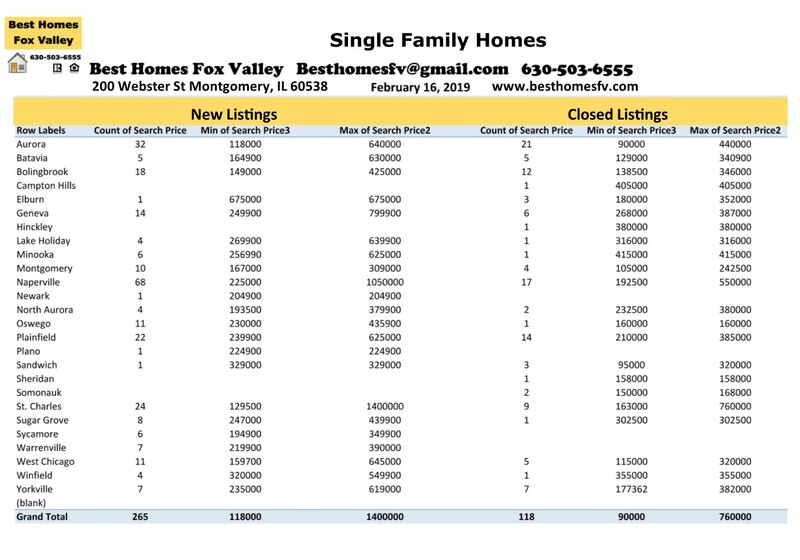 Market update Fox Valley-February 23 2019. Consistent describes the market this last week. 261 new listings this last week and 265 the week before. The market is increasing as we head into Spring market though. So far January had 878 New listing and February 1,032 and we still have 5 more days to go. Closed listings this last week were also consistent. 120 this week compared to 118 the week before. January there were 407 closed listings of homes and so far this month there have been 465. 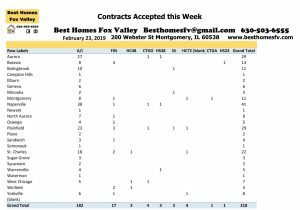 Contracts accepted this week were also consistent. 218 this week compared to 224 the week before. 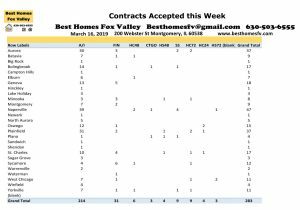 January there were 608 contracts accepted and so far February has had 832. It gives you idea of the closings to come. Short sale contracts accepted this week are still low. 3 this week compared to 6 the week before. 1 each in Bolingbrook, Minooka and Plainfield. Sellers accepted contracts this week that are contingent on the Buyer closing on their current home. 4 with a kick-out clause of 72 hours and 3 with 48 hours. 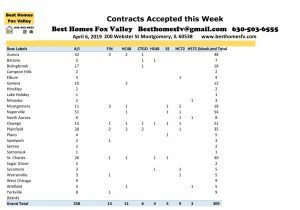 Contracts were also accepted by Sellers that are contingent the Buyer still needs to sell and close on their current home before purchasing. 3 with a kick-out clause of 48 hours and 1 with 24 hours. This is an update of Single-Family homes. If you would like information on attached housing or Multi-units just let us know. We would be happy to give you that information. You can also go to a new prospecting tool that you can access information anytime you like. Whether you are thinking of selling or buying a home our goal is to negotiate price and terms that are best. We can update the value on your home and provide you with a net proceeds so you can see the expenses to sell. IF you are thinking of buying you need to get pre-qualified with a loan officer so you know the price range and what type of loan will work out best for your situation. Market update Fox Valley-February 23 2019. Have a great week!